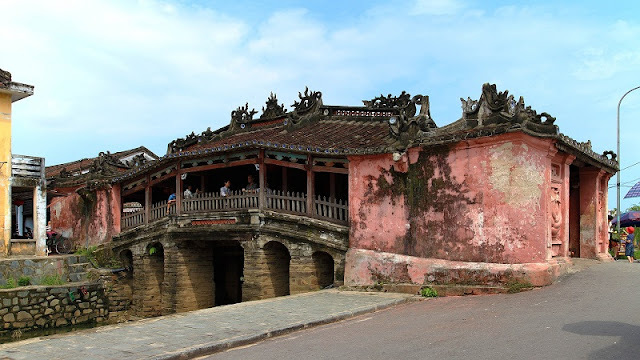 Home > Travel guide > If you have one day in Hoi An ancient town? If you have one day in Hoi An, where should you eat? where to visit, and where to shop. Here is our full itinerary for you that covers the most important things at a relaxed pace. Check out the links scattered throughout too for more information! Hoi An is famous for colorful lanterns lighting up the alleyways every night, but not many people know the appeal of the town in the morning. If you have just one day in Hoi An, then make sure to wake up early because you don’t want to miss the fantastic sunrise here. In the morning, Hoi An locals usually go to the beach at 5AM for swimming or for exercise and many tourists also head over to catch the sunrise. Besides the popular Cua Dai Beach, An Bang Beach in Hoi An was listed as one of the “top 50 most beautiful beaches in the world”. And once you witness the spectacle of the sunrise behind the mountains as you sit on the sandy beach with the waves behind you, the ranking will come as no surprise. Get as early as possible back to town to see women vendors in their conical hats preparing their street specialty – before the vehicles begin appearing on the streets. Then, after wandering around and getting a glimpse into local life, you will probably need to recharge your energy. A sandwich from “banh mi Phuong” at 2B Phan Chu Trinh Phuong or “banh mi Madame Khanh” at 135 Tran Cao Van Khanh is a good choice for feeding your morning growl. 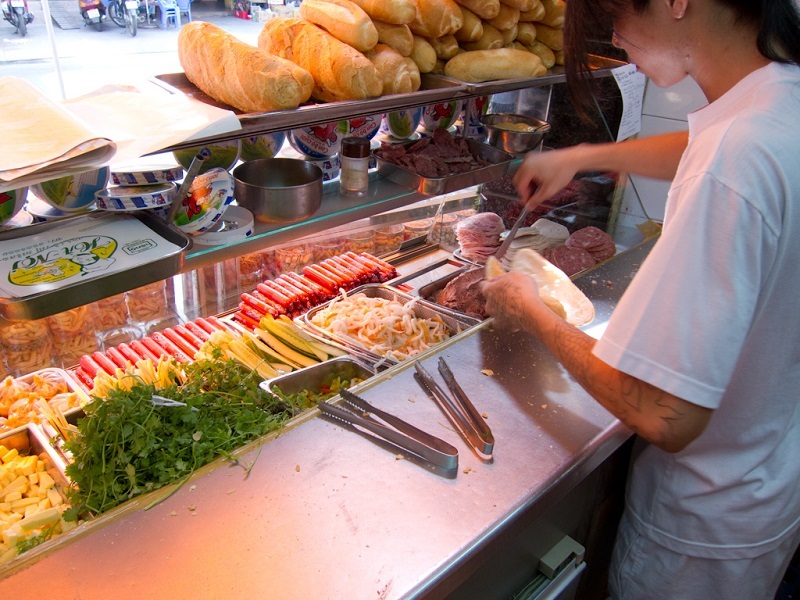 With only 20,000 VND, you will have a delectable baguette full of meat, vegetables, and delicious sauces. After finishing breakfast, find a random sidewalk cafe next to the Hoai River. There are many! The locals here often have their cup of coffee on the sidewalk every morning. Joining them will be a great way to spend the rest of your morning before the rest of the day begins. You can also have a look at Tra Que vegetable garden. 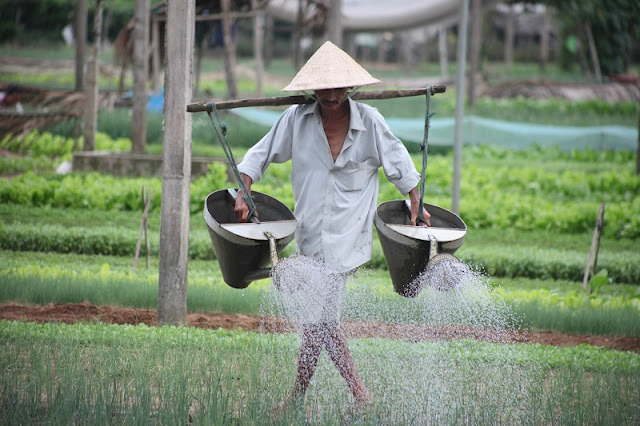 Here you will see locals planting and harvesting various vegetables and herbs on vast green fields. 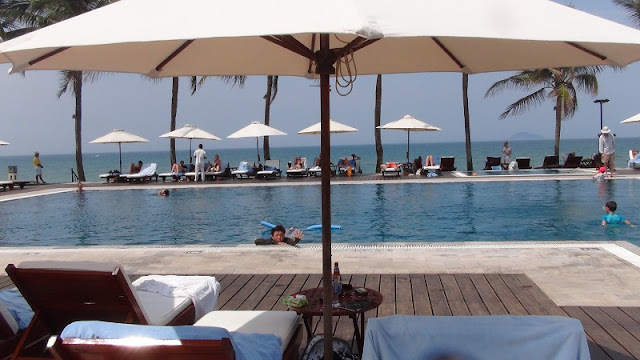 Tra Que is located off the main road (Hai Ba Trung) from An Bang beach to the Ancient Town Center. The vegetables harvested here usually go into dishes produced by restaurants and stalls around town. What makes this place special is that there is are no chemicals used in growing the plants in order to guarantee the best quality of vegetables. With a short visit to Tra Que, visitors can see firsthand how the farmers grow vegetables in their own ways. You can even try a cooking course that allows you to pick your own vegetables here. You should sign-up for a cooking course as it is a fun activity to do in Hoi An. and then enjoyed the fruits of our labor with a lovely lunch. Spend the rest of your morning exploring all the tea houses and museums in the old town so the rest of your afternoon will be at a leisurely pace. To learn about the life and culture of the locals of Hoi An, visit the old houses In the Ancient Town. These include but are not restricted to Hoi Quan Quang Dong, Phuc Kien, Tan Ky, Phung Hung, Quan Thang, Chua Cau, and Bao Tang Sa Huynh. There are many beautiful coffee shops in Hoi An ancient town which you don’t want to miss. The owners of these coffee shops really pay attention to every little detail to give you a unique experience. In the summer, you can rent a bike or a motorcycle to go to Cua Dai and An Bang beach. What can you do here? Swimming or sunbathing of course! Or eat. Just buy a coconut, find a shady spot, and that’s literally all you need. But bring your most favorite book for a most relaxed evening. Visiting Kim Bong carpenter village: you can spend around 30 minutes to take a boat to the famous Kim Bong carpentry village. Kim Bong carpentry village has become a trademark of Hoi An. This is not only the village carpenter specializing in producing pure products, but also the attraction alluring numerous of tourists. Hoi An is considered as the capital of Vietnamese cuisine, so skipping Hoi An cuisine is perhaps the most frustrating of your trip. Trying Com Ga Hoi An for dinner, after a long day hanging around, it is now time to eat again. Your stomach would feel happy to be treated with com ga Hoi An. 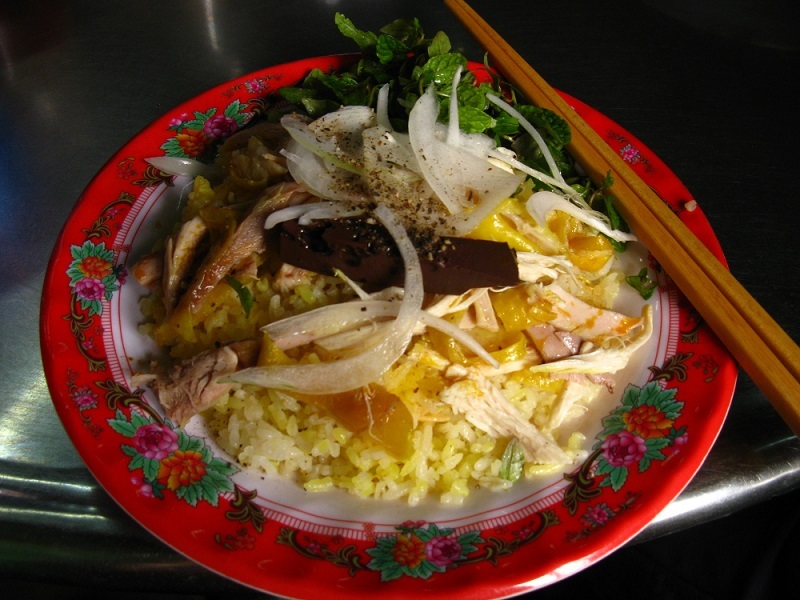 Besides the well-known dishes such as cao lau, and mi quang, Hoi An’s cuisine is also famous for chicken rice. A chicken rice dish consists of rice and boiled chicken, served with vegetables. According to the locals, the chicken must be free rangers that have only spawned one time because they are believed to give a stronger and firmer taste. The rice used has to also have been stored for at least one year or more. And more interestingly, people bring vegetables directly from Tra Que vegetable village nearby. Such a sophisticated preparation creates a flavorful dish that is hard to duplicate anywhere else. This is probably the most welcome visitor experience. as tourists as well as travel agencies talk about the magical beauty of Hoi An in the evening. Hoi An by night is very calm and magnificent. The whole town will be lit up by a thousand lanterns. The ancient architecture and the nice antique atmosphere will make you feel as if you are getting lost in a fairy tale! 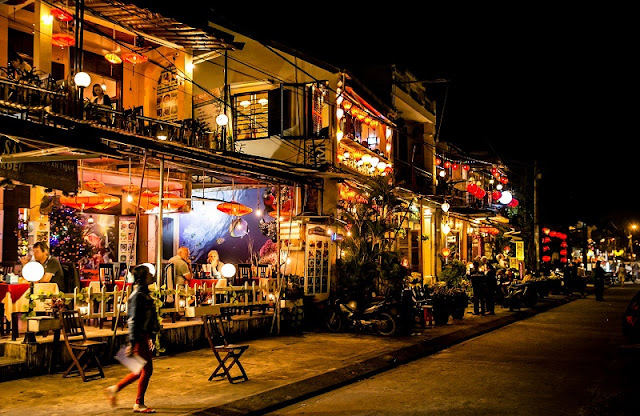 It is not a mere coincidence that the Ancient Town of Hoi An was honored as one of 20 places where you could have the best nightlife on the planet. When the night falls, this place seems to put on a very glamorous outfit. There are many things to do in the town at night. You can stroll through the lantern-lit alleyways, take a boat down Hoai River and release a floating lantern or two, eat random local food, admire the Japanese bridge, or go shopping in the Night Market. There are great restaurants and bars alongside the river as well so you can have a delicious meal with a view. It is a beautiful place to spend the night – with a mix of the old and new. Things have probably changed over time but there is still a rustic charm of this old town that will capture you and make you want to return time and time again. So that is what I can tell you about Hoi An. A day in this city may sound a little busy but it will undoubtedly help you create many memories to reminisce about later. Our advice is to really spend about 3-5 days in Hoi An. This is when you can really grasp what the city is all about. Plus Da Nang nearby has so many sites and beaches to see too – the Marble Mountains, Ba Na Hills, My Son Temples, etc. 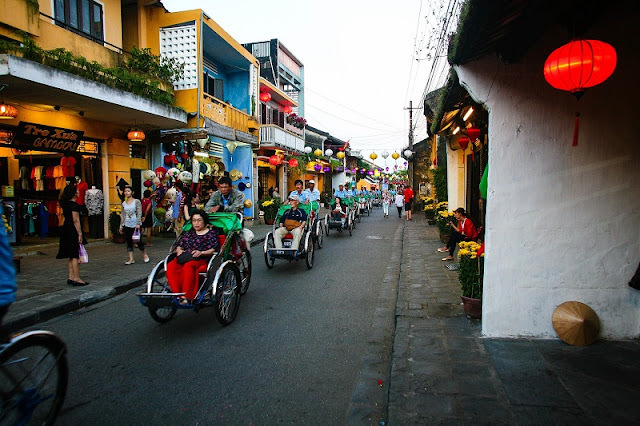 If you do end up being able to spend more than one day in Hoi An. It’s a bit more relaxed and at a slower pace.